Can You Spare an Hour? 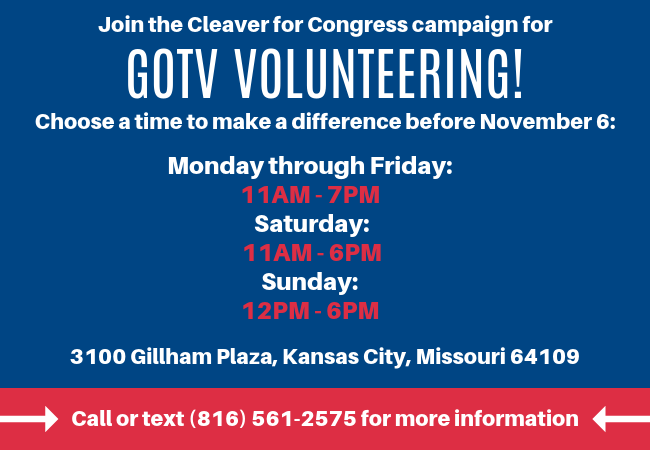 We’re hosting daily volunteer opportunities at Cleaver for Congress HQ to reach voters across our district and get out the vote this midterm election. Bring a friend (or two!) to help with post cards, phone calls and mailings for Congressman Cleaver. Two hours is all it takes to make a difference on November 6th, so join us for a shift (or two!) at Cleaver HQ (3100 Gillham Plaza, Kansas City, Missouri 64109).